Why do Insurance Companies choose American Restoration? 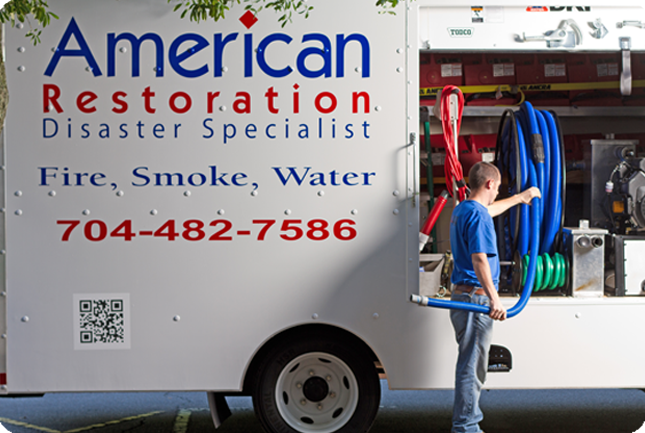 As an insurance restoration company, American Restoration is the top choice of many insurance professionals when a policy holder’s home or business is damaged. Our experience and focus allow us to evaluate losses and provide appraisals quickly and efficiently. For major insurance claim events, we ensure that restoration and repair is conducted on time and within budget by our team of experts. With over 40 years of restoration experience, we can handle emergency services and repairs 24/7. As a member of DKI, a national network, we have access to a vast amount of resources and can handle jobs of any size. Not only are we a fully licensed general contractor certified in North Carolina and South Carolina but we also offer a 3 year guarantee on work performed. Our knowledgable project managers can advise you and the policy holder of the cause of incident and provide an outline of damages, before a claim is even filed. We use Xactimate, an industry standard pricing system you can rely on. We can also calculate using T&M, upon request. Cutting edge technology, on-site laundry facility and storage capability enables us to salvage more items and to securely store contents, eliminating additional warehouse cost. We employ local people and local vendors operating on a philosophy of providing exceptional customer service and professionalism. American Restoration employees undergo a criminal background check, drug test and must maintain a clean driving record. We want to build a relationship with you and your agency. We are available for you 24 hours a day, 7 days a week.